This premium power controller system is a network-controlled power switch provides remote and central management of AC power distribution through LAN, WAN, or internet. It is designed with versatile functions such as distant power reboot, equipment power on/off control, web/network administration, power event scheduling, power event alerts. 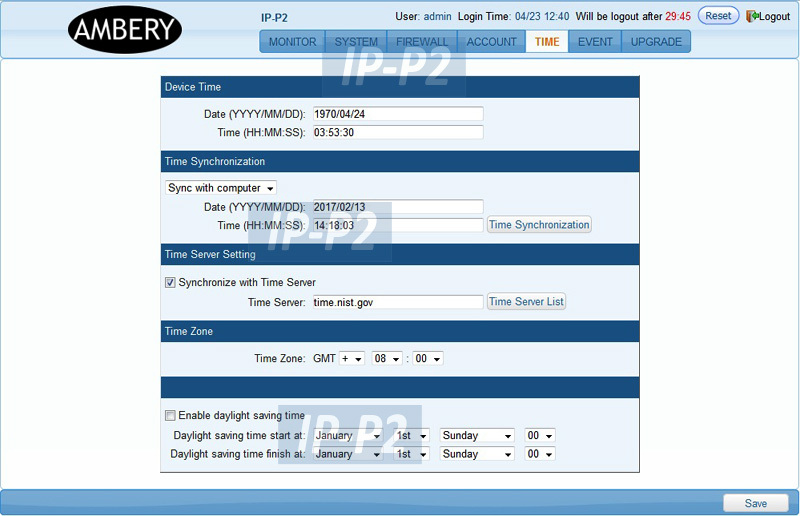 reduction of server/data center downtime and labor costs with remote power control. avoids power surges and UPS overloads by controlling power-on and power-off sequences. auto-reboot the failed network devices. Administrators can control network devices or power equipments from any locations within local network or internet and saves trips of technical personnel. Eliminate service calls, system blackout down time and increase reliability. Each AC power outlet can be independently powered on, off or power cycle for a immediate reboot, time-delayed reboot and power event scheduling. 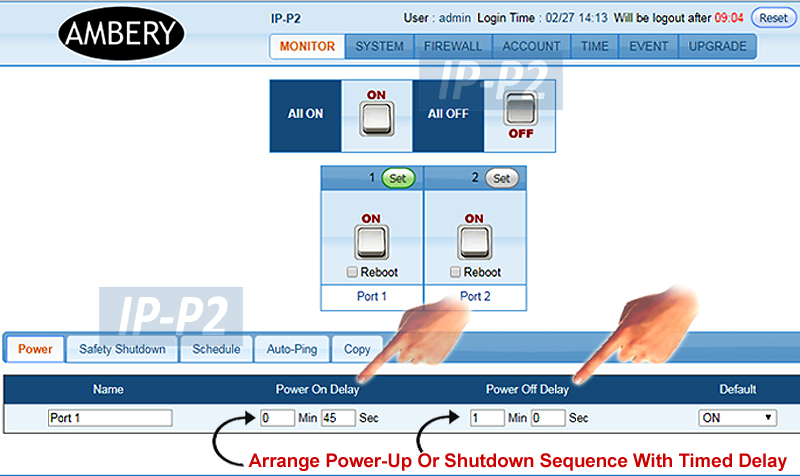 Users can have complete control over when and the how powered equipments are restored are restored with a time delay or scheduled for On/Off shutdowns to conserve energy in the data center. Designed for high voltage resistance and protection for leakage of electrical currency with 12.0 Amp total max current output. This unit can perform power operation at any specific moment or on daily, weekly, monthly or yearly basis. For instance, users can program the connected power device to be turned on/off or rebooted performed daily at 11:00 AM, weekly on every Sunday at 7:00PM or yearly with specific month, day and time programmed in advanced. 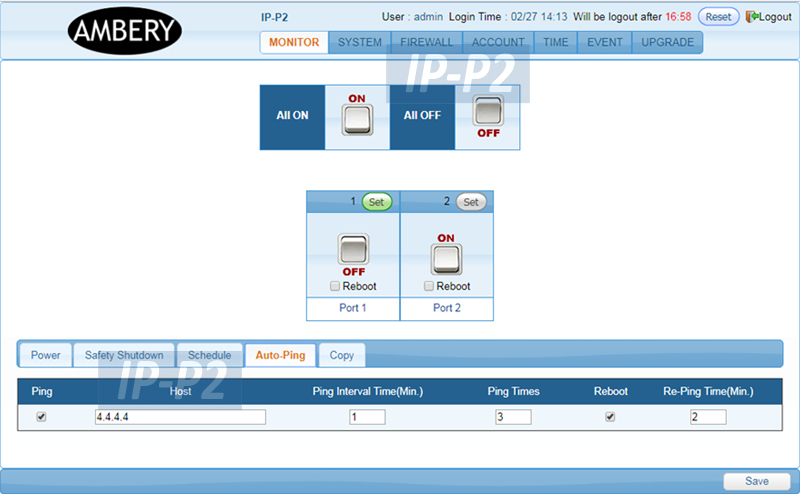 The auto-ping function will automatically check the monitored network device's IP address periodically or any public domain address such as 4:4:4:4. Once the network equipment failing to respond the ping request over the user-defined event counts and preset time period, the programmed power action will be executed, which can be a timed reboot and alert email sent. This intelligent power switch supports multiple users access with password security. 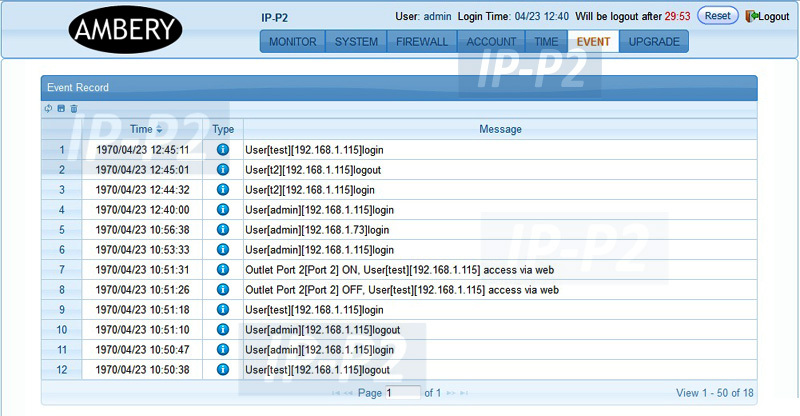 Manager can assign permissions for each user to access all or only the power outlets assigned. This unit also supports firewall function by providing both IP and MAC address filters to prevent unauthorized user from gaining access to the switch and devices connected through the network. Supports power cycling sequence with priority so each power outlet can be turned on/off or rebooted with timed delay in seconds or minutes to prevent all power devices from starting up simultaneously to cause sudden overloading or dropped loads. This remote power switch has a circuit breaker built in for protection of devices connected to the power switch. This remote power switch will be automatically shut down for responding to a current overload or short circuit condition. A master power on/off button on the switch box itself for local operator to override the remote control mode and take control of this power switch in an emergency. No need to unplug the power cord or run to trip a breaker from the power panel. Warning alerts can be programmed to be sent out right after critical power conditions occur so manager can take preventive measures if needed. 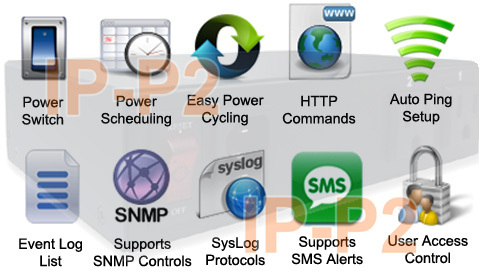 The alert message can be generated automatically via emails, SMS text messages or SNMP trap notification according to the pre-set conditions. Administrator can also check the operation events and warning events. The event log can be viewed directly or archived by downloading from the web page in .csv file format and saved into the hard drive. Protect sensitive devices or valuable equipment by keeping them powered off when not in use. Great for energy related or network application by powering down equipments when not needed for power savings and to save on wear and tear or powering up environmental system. This 2-port remote power switch is 1U rack mount ready. The rack mounting ears are sold separately. User can mount this equipment on a standard 19" rack by purchasing the optional rack mounting ears from us. 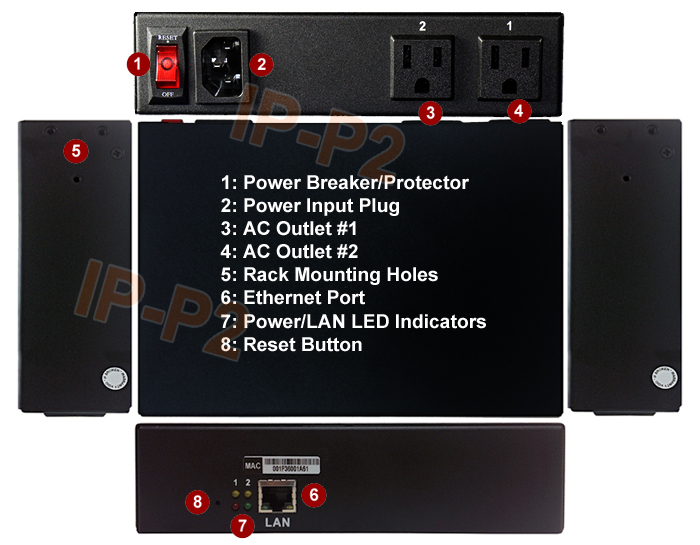 Professional IP-addressable power distribution unit with built-in web server with 2 AC outlets. 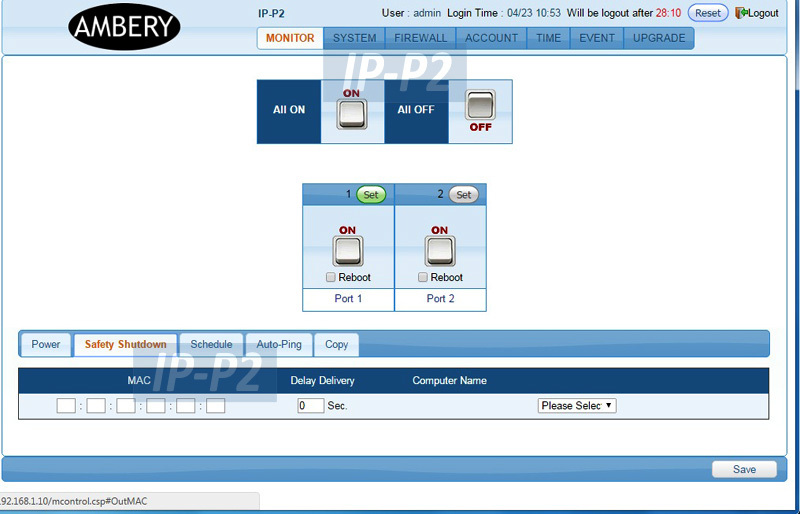 Remote and central management of AC power distribution through LAN, WAN/Internet or RS232 console port. All power outlets can be independently controlled locally and remotely. AC outlets from the power switch can be turned on/off, power cycled for a immediate reboot or reboot with a timed delay, power cycle sequence with assigned priority and power event scheduling. Complete power control via web, network, PC RS232 terminal or On/Off button on the front panel. 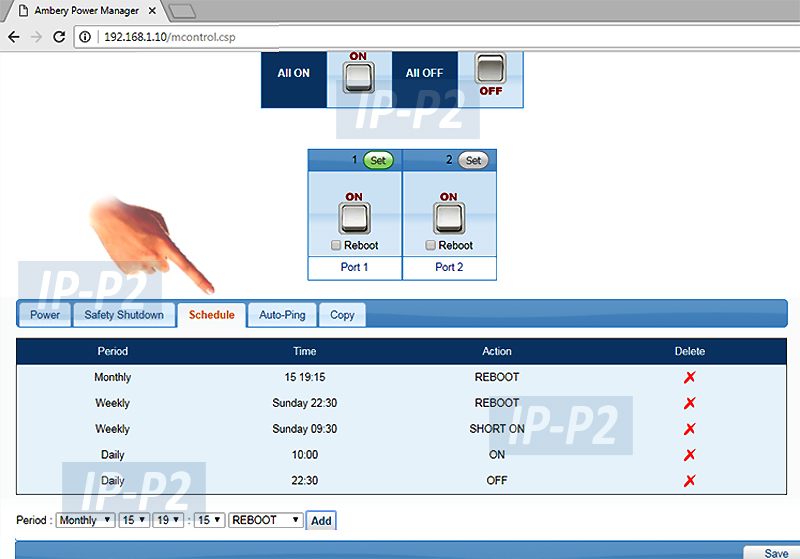 Easy web scheduling for power operations performed on specific outlet daily, weekly, monthly and yearly. Supports API functions, HTTP and RS232 commands for engineer to develop customized power management applications and build integration with other programs. 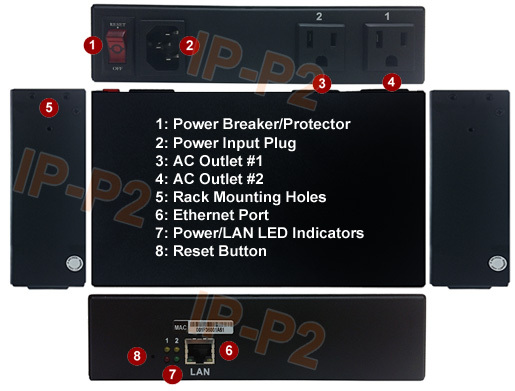 RS-232 console port for connection with PC is available when network is down or no internet access..
Manual power on/off button to override the existing power status and gain immediate control from local access. LED displays for power status, total current and control mode indication. Supports Wake-On-LAN protocol for remotely starting up computers. Supports software safe shutdown function. Terminating running applications before powering off the computers or data servers. Featured with Auto-Ping function for detecting any failed network equipment and perform a timed reboot or other power control function. IP filter/mask security function with multi-users access management helps manage user privileges and prevent unauthorized access. Early warning alert sent by email, SMS text message or SNMP Trap to notify authorized personnel. 12-AMP circuit breaker protection to avoid power overload and protect connected devices. 1U rack mount ready. User can easily mount this equipment on a standard 19" rack by purchasing the optional rack mounting ears. Designed for high voltage resistance and protection for leakage of electrical currency. 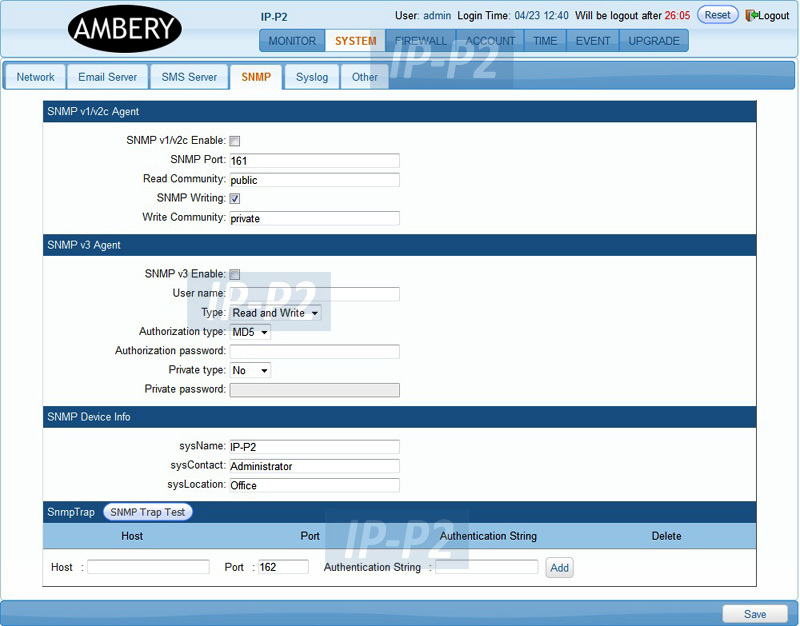 Supports TCP/IP, UDP, SNMP, DDNS, SNTP and HTTP protocols. 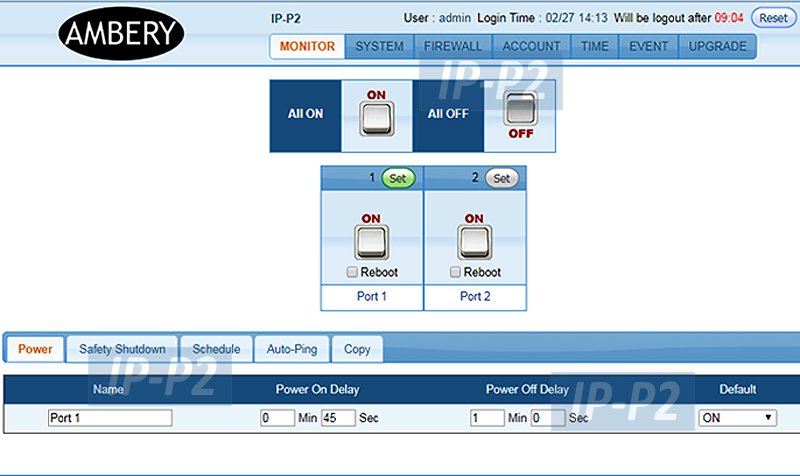 Web GUI control through LAN/WAN network. 12.0 Amp max total for both outlets. 8.0 Amp max per each power outlet.